Here’s what’s up in the world of TV for Sunday, January 15. All times are Eastern. The Young Pope (HBO, 9 p.m.): With the unfortunate cancellation of The Borgias some years back putting an end to Jeremy Irons’ papal reign and The Vatican shut down before Kyle Chandler had the chance to look down on his fellow cardinals and say “Let me tell you something,” the Catholic Church has come up short in its representation on cable dramas in the last few years. Tonight HBO aims to remedy that with The Young Pope. Jude Law stars as Lenny Belardo, an American cardinal raised to the chair of Saint Peter as Pope Pius XIII, who holds his cards close to the vestment as to his true intentions. Created by The Great Beauty’s Paolo Sorrentino and with a supporting cast that includes Diane Keaton and James Cromwell, this looks to fill the “lavish and complex” category that HBO’s always trying to monopolize. Eric Thurm, who won our conclave to provide regular coverage, is eager to watch and hoping the string of Twitter jokes that its title inspired are just the tip of the iceberg. 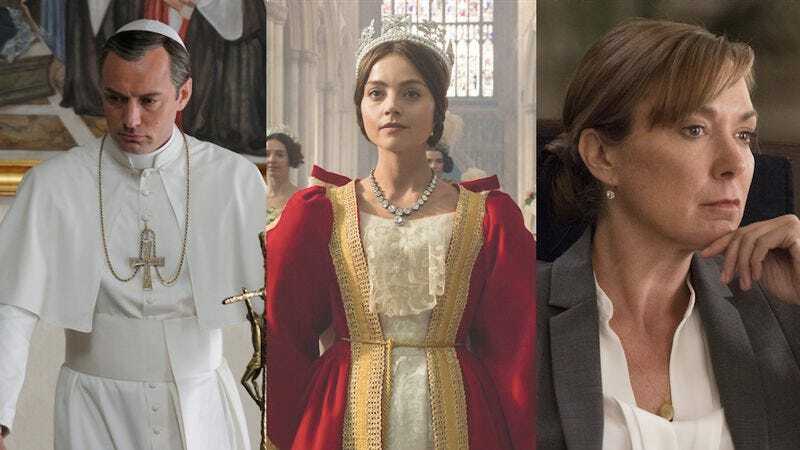 Victoria (PBS, 9 p.m.): If the Catholic Church has been underrepresented on television dramas, the English monarchy has enjoyed a dominance of late not seen since the Acts Of Supremacy, thanks to the popularity of series like The Crown (or Golden Globe winner for Best Drama The Crown) and The Hollow Crown. Jenna Coleman of Doctor Who becomes the latest to ascend the throne as Queen Victoria, balancing her royal duties with her loyalty to her husband Prince Albert (Tom Hughes). Genevieve Valentine, whose Reign coverage proves her undying love for melodramatic royal dramas, once more pledges her service to Her Majesty. Our personal hope is that it turns out that this entire series is a huge misunderstanding that came when the Doctor inadvertently stranded Clara Oswald in the Georgian era. Homeland (Showtime, 9 p.m.): Showtime’s oft-frustrating political espionage thriller takes on a particular real-life resonance, as the sixth season will focus on the transition to a new presidential administration. It’s one colored with shades of both real-life candidates, as President-Elect Elizabeth Keane (Elizabeth Marvel) is a former New York senator who has her own ideas about how the nation’s intelligence apparatus should work. Elsewhere, Carrie goes to work for a Muslim-American advocacy group, but if history is any indication the odds are good she’ll be back in the spy game before too long. Joshua Alston’s just happy to be back on American soil after successive seasons spent largely in Afghanistan and Germany. AFC Divisional Playoffs, Pittsburgh at Kansas City (NBC, 1:05 p.m.): Like our fellow Monday night What’s On Tonight correspondent, we like sports and we don’t don’t care who knows. Plus, according to our editor-at-large, every playoff is a season finale, so they qualify for inclusion here. NFL playoffs are in full swing, as the Steelers attempt to knock off the Chiefs and progress to the AFC championship next week. They beat the Chiefs by almost a 3-1 margin when last they met, so odds are in their favor. Sherlock (PBS, 7 p.m.): Sherlock has its potentially last episode tonight with “The Final Problem.” Between the reappearance of the detective’s sister, Sherlock’s “oldest enemy” set to take revenge, and a finale named for the story in which Sir Arthur Conan Doyle seemingly took the life of his greatest creation, a shadow hangs over what could come this evening. And if it is the end, it is with a heavy heart that Allison Shoemaker takes up her pen to write these the last words in which she shall ever record the singular gifts by which Sherlock, as alternatively frustrating and brilliant as its title character throughout its life, was distinguished. First Family Of Hip Hop (Bravo, 9 p.m.): Bravo’s latest reality series has a hint of Behind The Music about it, as we go behind the scenes of Sugar Hill Records. The Robinson clan owns the groundbreaking studio that established the first hip-hop record label and produced the first charting rap song in history, and are looking to reestablish the brand after the passing of matriarch Sylvia Robinson. We greet most new reality series with a wary eye, but this is the first one with the possibility of producing a soundtrack someone would actually want to listen to. The 44th President: In His Own Words (History, 9 p.m.): All of these fake regime changes tonight also make us keenly aware that a real-life era is drawing to a close with the last week of Barack Obama’s presidency. Tonight History offers a look back on his career with a two-hour special made up of extensive interviews with Obama before and after the election. Soak it in, everyone: only a few days left before the idea of the president speaking in his own words goes from reason and eloquence to a 3 a.m. tweet meant to settle a petty grudge. Murder Calls (Investigation Discovery, 10 p.m.): “Detectives must decipher the contents and subtext of a 911 call to uncover the truth.” Spoiler alert: The call is coming from inside the house. Kings, “Goliath” (NBC.com): A night full of rulership changes both in church and state led us to this 2009 NBC series that combined both into one, blending biblical myth with contemporary politics. All hail King Ian McShane!